At the end of the year 2012, the paper "Secure stadium experience" was introduced into German football. While this package of measures is into its second season now, we would like to see how our European neighbours handle the topic of security in football. For the start of this series, we took a look at Austria and Turkey. In this text, we set our eyes on how things are in the Netherlands. The original article was published on our German site and then translated by Nadja. The situation of football fans in the Netherlands is one of the worst in whole Europe. Partly self-imposed, there are a lot and extreme restrictions. Also because of that, one can find more and more Dutch football fans around the Westfalenstadion who just want to relax and watch a game for once. The situation in the Netherlands has become a lot safer the past years, but at a high price. High penalties for violent hooligans, compulsory registration for people with stadium bans, registration to buy tickets, combi tickets, all-seated stadiums, trenches between the stands and the pitch, games without spectators, empty away stands, alcohol bans in a wide range around the stadium and total CCTV coverage in and around the stadiums and in the city centres have made Dutch football stadiums safe and destroyed the football experience. Compared to the situation in other countries, these measures are not completely unfounded or highly exaggerated. The violence in Dutch football is more extreme than in other countries and partly fed by the drug (mainly cocaine) and alcohol abuse of a part of the hooligans. In a game between The Hague and Ajax in 1987, glass bottles, seats and pieces of concrete were thrown at each other over the neutral stand. In 1991 a fan of FC Twente was killed in a knife fight in the city of Enschede by Feyenoord fans. In 1997, the growing violence in hooligan fights between Ajax and Feyenoord resulted in a dead Ajax fan. He died of a brain injury that was inflicted on him with a claw hammer. The weapons used (knifes, baseball bats, hammers) and the course of the battle on a field near the motorway makes one’s blood run cold (http://www.volkskrant.nl/vk/nl/3744/Sportcanon/article/detail/1033257/2010/09/20/De-Slag-van-Beverwijk-van-hi-ha-naar-een-ongegeneerde-moordpartij.dhtml). The possibility of revenge has been in the air ever since and is announced by Ajax hooligans regularly. Games between the two clubs are played without away supporters since quite some time. In 2006, hooligans of Ajax stormed the club home of ADO The Hague and threw Molotow cocktails and Nitrate bombs. The people inside the home, including many teenagers that didn’t belong to the hooligan scene, were attacked with knifes and baseball bats and some of them hurt badly. 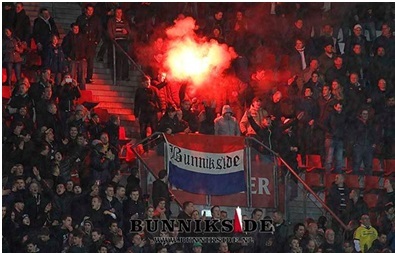 The whole was a revenge for the fire in the Ajax fan home a year earlier that was said to be set by ADO hooligans. Even if this kind of violence luckily is rare these days, there’s the possibility of vandalism and violence at many games of the risk clubs Ajax, Feyenoord and ADO The Hague. 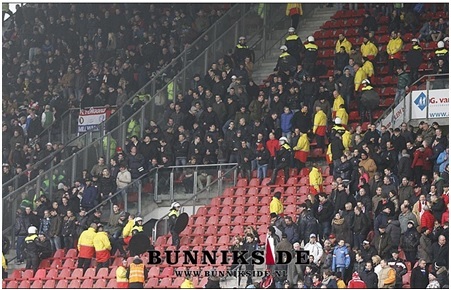 But also PSV, Twente, Utrecht and Groningen have quite some potential of violent hooligans among their fans. The tragedies in English football in the 80ies were very fast reflected in Dutch football. All stadiums were converted into all-seater and trenches were built between the stands and the pitch. Luckily, the seating is not handled as rigid as for example in England. On the Ultra stands, most of the people are standing and the sphere in the home stands is usually very good. If it serves safety that there are easily breakable plastic seats that can be used as missiles is questionable. The fans suffer most from the combi tickets. The journey to an away game usually begins at the home stadium. There one has to show the ticket for the journey that is converted into a coach or train ticket and the fans travel to the stadium of the opponent together. The coaches are parked in separate cages, far away from the home supporters. 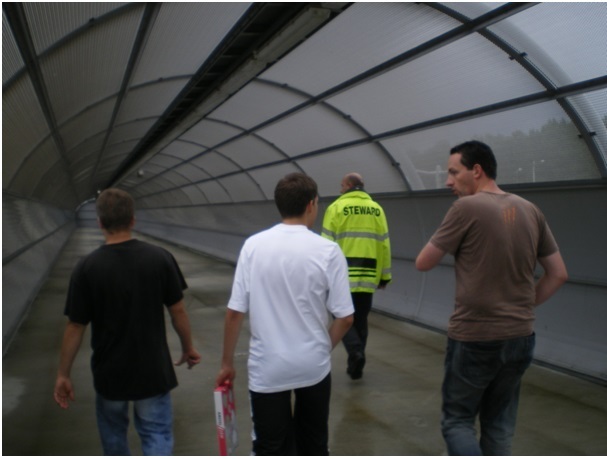 Accompanied by the police and the stewards, the fans are brought to the stadium through separate tunnels or crossovers. Also there are separate platforms to avoid that the away fans can get in contact with the home supporters. The guest stand is often completely surrounded by Plexiglas and in the upper tier of the stadium. The feeling of being in a stadium is therefore completely lost and also the singing and clapping is not heard on the pitch. The fact that away fans also have to pay quite a lot of money for the tickets is reducing the pleasure even more. Around 70% (!!!) of all games are classified as risk games. There are three categories (A, B and C) that implicate different measures. Category A games are not requiring any travel regulations, in category B, there’s the possibility for combi tickets and in category C, the combi travel is compulsory. Also the serving of alcohol is adapted to the category. In category C games, there’s no alcohol in and around the stadium. Only when the away supporters are back in their coaches or trains, the pubs in the area are allowed to serve normal beer again. Pyrotechnics seems to be a little issue compared to the others and is hardly noticed in the Netherlands. There are quite heavy penalties of up to €1000 and a stadium ban of 5 – 10 years and sometimes detection dogs are appointed at the entrance, therefore pyrotechnics is usually applied that the offenders are not recognized (under banners by mummed people), but there are hardly any incidents that are covered by the media. 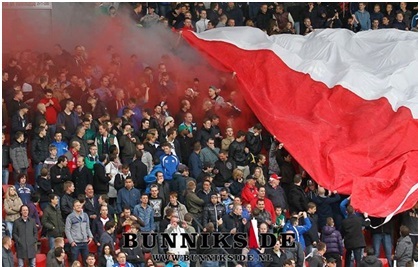 An exception was the cup final 2014 between Zwolle and Ajax where the fans of Ajax provoked a later beginning and an interruption after 5 minutes with the directed throwing of smoke-bombs to the pitch. In the end, the media coverage was more mocking than shocked as the game was halted at the score of 1:0 and ended 1:5. The break gave the opponent the possibility to recover from the early goal. It’s not surprising considering the history that the fans are quite self-aware and name their own behaviours just as much as the reason for the measures as for example the behaviour of the police. The relation with the police is quite relaxed as long as they are not showing their power with dogs, sticks and horses. The media is accused regularly by the fans for their sensational coverage. Criticism of the clubs or the authorities on the other hand is quite rare among fans. The most frequently asked question in discussions with Dutch football fans is: “Why is it possible in Germany for fans of both clubs to walk on the same paths and not in the Netherlands?” I still owe them an answer. A danger for the future lies in the fact that more and more fans are circumventing the combi regulation and are therefore standing outside the away stands between the home supporters what basically makes a mockery of the regulation in the worst possible way. Also the drug abuse is still present and it is said that in most of the stadiums in the bathrooms under the Ultra stand cocaine consumption is quite common. As part of the violence in the 80ies and 90ies was due to cocaine abuse, that sounds quite scary. But one can certainly not deny that the measures have paid off. If it was worth the price, everyone has to decide himself. To be an away supporter in the Netherlands wouldn’t bring me much joy and I don’t think it’s a surprise that the away stands often seem quite abandoned also in games where away supporters are allowed.